Jordan Reeves and VideoOut are building an archive of coming out tales. As a gay man living in Alabama, Jordan Reeves didn't know any other queer people. "I didn't even know people that knew gay people," said Reeves. "We referred to the community as homosexuals." All Reeves knew about queerness was that if he wanted community, he'd have to find it himself. In June of 2016, VideoOut recorded their first story, and in the two years since Reeves has been traveling the United States and amplifying the voices of queer people by capturing their coming out stories, working alongside organizations and communities to build an extensive library of tales. 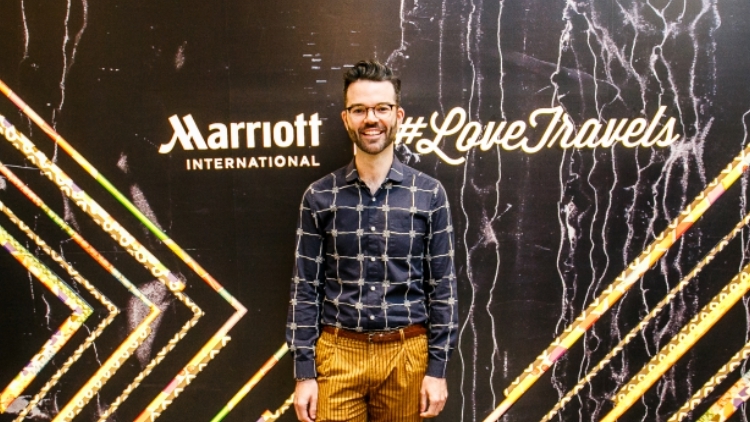 This year, Reeves was one of four grant recipients of Mariott's #LoveTravels Beyond Barriers Social Innovation Investment. At the True Colors Summit in Atlanta this month, OUT caught Reeves' panel and chatted with the activist about the incredible power coming out stories can have on the lives of the people who hear them — queer and ally alike. OUT: All coming out stories obviously have something in common: they're all about a person coming out. And all coming out stories are different because every person is unique. Is there anything you found that all coming out stories have in common? Jordan Reeves: Yes. Regardless of a person's situation, whether they have the most accepting family and friends, or if they are in a terrible situation, there is an internal struggle. It's universal. In every story that I've heard, people are, I think, so conditioned in our society to think that they have to be heterosexual, they have to be normal in some way, that being themselves is hard. It's a battle that you fight internally before you ever even begin to fight it externally. In the stories, people always talk about having that moment where they reconciled their feelings. Something that comes up a lot is how people ease into their coming out process. Whether that's they start out by identifying as something that they're not because they think it will make it easier. For instance, a gay man might identify as bi. I think that's all society's fault, and it's not the individual's fault, but I do think that it is something that's consistent throughout every story that I hear. I want to go through the three points you made in your session. The first is that you come out for yourself. I think we just have to realize that we're all magical. We're all powerful, and our voices deserve to be heard. We've been told that we have to stay quiet, that we have to fit in, that we have to be something that we're not. There's something cathartic about coming out, about sharing your story. It's good for you. It's energizing to the soul. When you come out for yourself, it's like stepping into who you really are. When I say come out for yourself, it's not selfish. It's doing something good for you, so that you can in turn be the best person for the world. If you come out, if you truly live as who you really are, then the world is gonna be better for it. Maybe it's a little selfish too. There's nothing wrong with that. Your second point is come out for the community. I don't think that there's any gift that we can give to other LGBTQ people that's greater than being authentically ourselves. If we step into who we really are, then we join alongside people who've fought for liberation. We affirm their work. We also are an example for those who are struggling to find their voice. Especially in these times ... Maybe not especially in these times. It's been a hard place to live for LGBTQ people since the dawn of modern time, but right now it feels like it's worse than it's ever been, at least in my life. So, I think coming out is a way that we can all stand together and fight the forces that are in power. We can do so linked arm-in-arm with our stories as our greatest tools. Finally, we come out to build bridges. What does that mean? When I came out, my family was not accepting. I heard, "You're going to hell. You're brainwashed. You need to stop hanging out with those kinds of people." I heard all these things that were so hurtful and hateful from my family, the people who I knew loved me. It wasn't until I was comfortable in my story, when I had rested in who I really am, and until I had gathered other stories around my own and started sharing those stories with my family that a shift happened. My dad called me not too long ago and he said, "Hey, if anyone tries to take your rights away, I'll be the first one to stand up for you." There is this innate power in stories. I mean, it's something that's ingrained into who we are. We used to sit around fires, right? There's that image of old mankind or humankind where people are sitting around a fire telling stories. That's how we survive. I really think, to a large degree, even though it's drowned out by everything that's going on, our stories are still that powerful and they still mean that to us. It's how we survive. So, building those bridges using our stories is not new. It's just something that we have to get back to. You said in your session that it's impossible to hate someone whose story you know. Do you really believe that to be true? Yeah, I really do. I don't mean knowing just facts about a person. I don't mean knowing statistics. We can share statistics until we're blue in the face, and not change a person's mind. That's why people still deny climate change, right? But when you sit down and when you really listen to a person, and you get to know that person's story, there is also something innate within us that compels us to empathize. It's not natural for us to want to destroy other people. Granted, there are people who want those things. Those are the outliers, and we have a lot of work to do with those people, but generally speaking when a person hears another person's story, they can't help but empathize with them and love them, at least in a minimal way. Part of this project functions as an educational tool for straight non-LGBTQ people, but is part of this also compiling an archive for queer people? What do you think that we learn watching other peoples' coming out stories? I mean, we're human too. We are intimately familiar, we're experts in our own experience, but that doesn't mean we know everything about the whole LGBTQ plus experience. We have a lot to learn about other people who are living their own experiences. I think, if anything, it can increase our capacity to empathize as well. If you watch some of the videos, sometimes you'll hear people say, "I wasn't accepted in this community. I'm LGBTQ, but it was not my home. The people that I was around when I came out didn't accept me for who I am." So, I think sometimes we have to look ourselves in the mirror as LGBTQ people and say, "We want liberation. Where are the barriers that we're building in our own lives? How can we break those down?" I think by watching these stories, we can make that happen. Do you think that in some cases in people who are part of very marginalized communities, extreme religious communities that the ability to come out is, in a way, a privilege? There are cases when coming out is not the right move. When it's unsafe, especially in places where your life is threatened. Don't come out, but know that you have a community of people who is supportive of you, and I think it would be, I don't know presumptuous of me to give advice to those people because I had a certain amount of privilege coming out. Though I came out in an incredibly religious environment, incredibly conservative environment. I still knew that I was gonna be safe and everything was gonna be okay. But if I did have anything to say to people who are in those spaces where it's not safe and they don't have the privilege of coming out, I would say do your best to find a family. You're not alone. There are other people like you. Sometimes it can be a life's work, but just rest in the hope that you're not alone. In a perfect world one day where LGBTQ equality is the norm, do you think we'll still need to come out? Will coming out stories still be powerful? I think they'll always be powerful. Just because the women's lib movement has progressed to the point that it, where it is today doesn't mean that the story of women voting is not still powerful. Just because the Civil Rights movement happened doesn't mean that the story of slavery or racial inequity in the '60's is not a powerful story. I think coming out is exciting in a way that many stories are. When you announce something about yourself, a decision you've made, you celebrate that.